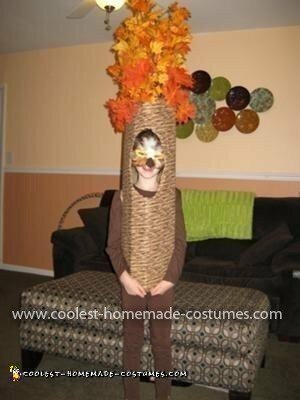 This is my daughter in a Homemade Owl in a Tree Costume. I purchased fabric that looked like a tree trunk and I glued it to cardboard. I cut holes for her head and arms. On the inside of the cardboard I hot glued stems with leaves on them and then I covered the backside with tan felt to cover up the bottem of the tree stems. I purchased iron on Velcro strips to close the back and I used that so it would make easy access to put it on and take it off. 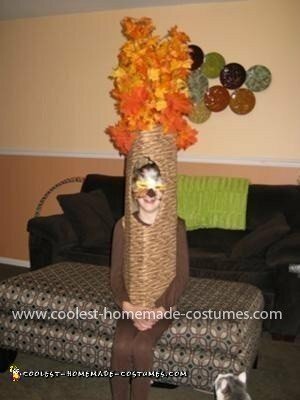 The mask was made by purchasing an assorment of brown, tan, black and white feathers and I then glued them to a mask that was purchased at the craft store. Hope you enjoy. 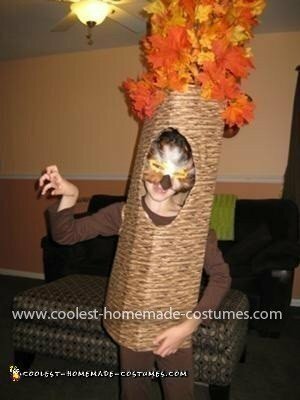 Homemade costume idea posted by Amy J.